Go kayak offers you for your seminars two choices of activity. 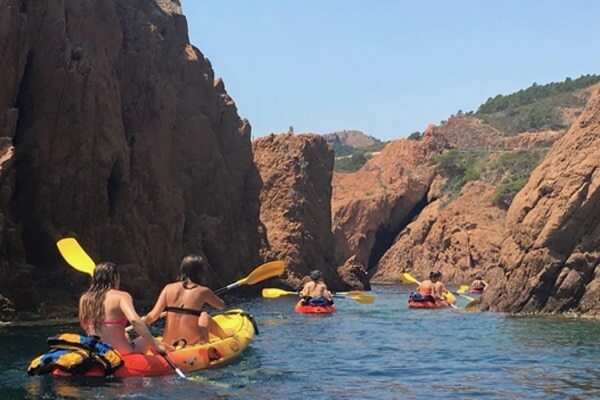 Go Kayak offers you for your groups, hiking in a sea kayak framed and animated by a professional instructor, a playful approach to the activity and a discovery of the flora and fauna which is so rich along the French Riviera. Our fleet of kayak is adapted to the hike thanks to their high stability and their form shaped in such a way so that the slides of the boat are optimal under the impetus of the paddler which will aim to provide a real pleasure of success among the participants. Hiking around the iles de Lérins with lunch break in a beautiful cove. Hiking from Nice up to Saint Jean Cap Ferrat, lunch break in a small cove and bathing. Hiking around the Cap d'Antibes, interspersed with pause bathing. At the start, the aim is to make a maximum of back and forthto the 20′, 10 points in single and 20 points in double, -5 if fall, -10 if buoy not circumvented.